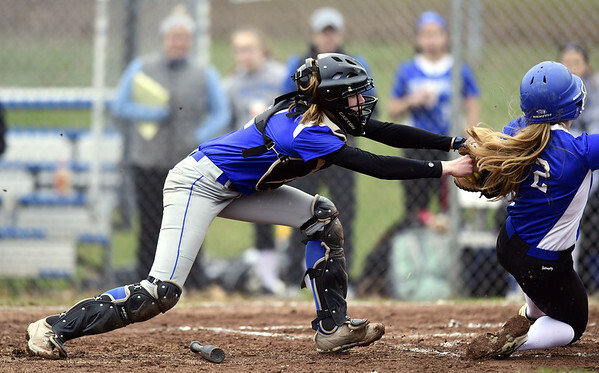 BRISTOL - In a much-anticipated softball game between Bristol Eastern and Southington on Tuesday, two of the best in the CCC duked it out for more than five innings in a hard-fought, entertaining bout that ended in anticlimactic fashion. Bristol Eastern led after five innings, but Southington went ahead in the top of the sixth before play was halted due to rain in the bottom of the sixth, causing the final score to revert back to the last full inning - the fifth - officially giving the Lancers a 3-2 victory. In the fourth inning, Bristol Eastern’s Alyssa Hackling turned on an 0-1 pitch, sending an RBI double to left field that put the Lancers ahead 3-2. Lancers pitcher Erin Girard then worked her way out of a jam, as Southington put runners on second and third with no outs in the top of the fifth. Girard induced two straight groundouts - one right back to her, the other to first baseman Lauren Aparo - before racking up an inning-ending strikeout. With rain starting to lightly come down in the top of the sixth, the Blue Knights tagged Girard for three runs to take a 5-3 lead. Katelyn Lipsky smacked a game-tying RBI triple over the head of Lancers center fielder Zoe Lowe, Kelsey Fernandez plated the go-ahead run with a chopper down the first-base line - after an ensuing throw home wasn’t handled cleanly - and Gabriella Malachowski gave Southington a two-run lead with an RBI single to center field. None of those stats will count. In the bottom half of the sixth, the rain started to come down more heavily as the Lancers put runners on first and second with one out after Girard was hit by a pitch and Riley Giblin drew a walk. Southington head coach Davina Hernandez then came onto the field to survey the conditions. She walked over to home plate and the pitcher’s circle and saw the rain had turned the dirt into puddles of mud. Redman grabbed a bag of drying agent and poured some onto the pitcher’s circle. Moments later, though, the two umpires convened and determined the field conditions were not safe enough to continue play and called the game. There will be no continuation of the game at a later date. In the moments following the umpires’ decision, Redman and Hernandez were on the phone with their athletic department leaders and members of the CIAC to try to piece together the final ruling. The game got out to an explosive start, as Southington’s Chrissy Marotto led off by ripping a hard-hit line drive into the deep left-field corner. As she sprinted for home, Marotto was gunned out by Lancers shortstop Taylor Keegan after a relay throw from Lyzah Corliss. Paige McLaughlin laid down a tag on a bang-bang play at the plate. The Blue Knights (2-1) did put two runs across in the frame, however, as they took advantage of some early miscues by the Lancers (3-0). Abigail Lamson scored on a passed ball, and a misplay on a pop fly in the infield plated a second run - the ball landed in fair territory by inches past the first-base bag, allowing Malachowski to score. After surrendering the two runs, Girard got both of them back in bottom half by pushing an 0-1 pitch to right-center for a two-run double to tie the score 2-2. Girard (3-0) earned the win, allowing two runs (one earned) on 10 hits with three strikeouts. Julia Panarella allowed two earned runs on two hits with three strikeouts and one walk in two innings and Julia Theriault allowed one earned run on two hits in three innings for Southington. Posted in New Britain Herald, Southington on Tuesday, 9 April 2019 21:19. Updated: Tuesday, 9 April 2019 21:21.